JEFFERSON CITY, Mo. — West Platte’s run of Class 1 Missouri State Cross Country Championships trophies ended Nov. 8 at Oak Hills Golf Center. After claiming a spot in the top four each of the past three years, the Bluejays fell to 11th at the state meet with 265 team points — 175 behind St. Vincent and Hermitage, which claimed the title via the sixth-runner tiebreaker. Daniel Cicha earned top finisher honors for West Platte, just-missing the state medal cut in 28th place in 18 minutes, 6.77 seconds. The top 25 earn medals and all-state honors. Cicha improved on his 39th-place finish from a year ago while running on the third-place state team. He was the only runner on the team to previously run at state, but the Bluejays were still able to defend their Class 1 District 8 title, which they won for the 15th straight year on Nov. 1 at Platte Ridge Park. 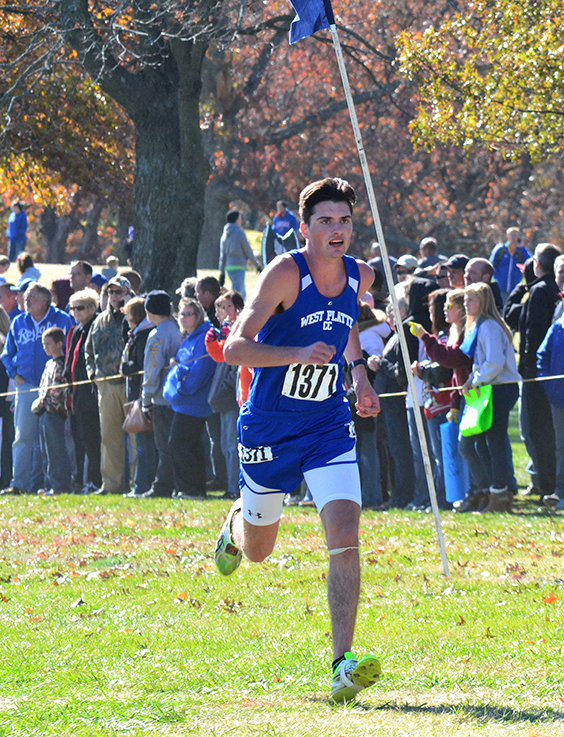 West Platte ran just one senior — Braxton Hill (34th, 18:23.54). Freshman Andrew Cicha (122nd, 19:59.40), junior Davis Pilloni (138th 20:30.76) and sophomore Connor McNair (142nd 20:40.49) rounded out the rest of the five scores that counted for the Bluejays. North Platte senior Blake Romaker finished his career on the state course, finishing 87th (19:27.24). He ended up as a three-time state qualifier after becoming the Panthers first ever representative as a sophomore. Dylan Stockman, a junior, finished 65th in 19:04.78 to become North Platte’s top finisher. North Platte also qualified a team for the first time in program history, sending the girls to state after earning the second and final automatic team slot in the Class 1 District 8 team standings. Bailee Romaker was the first North Platte runner to cross the line in 54th place (23:25.25) helping the team to a 12th-place finish out of 16 with 246 points. West Platte freshman Rachel Heili was the top local finisher (34th, 22:51.71). Shelby Fisher (77th, 24:02.88), Rayanne Daniel (81st, 24:15.87), Hannah Rice (107th, 25:09.65) and McKenna Fulton (114th, 25:36.57) completed the five runner tally for the Panthers.